Mental Health Matters Day Commemorative T-Shirt! 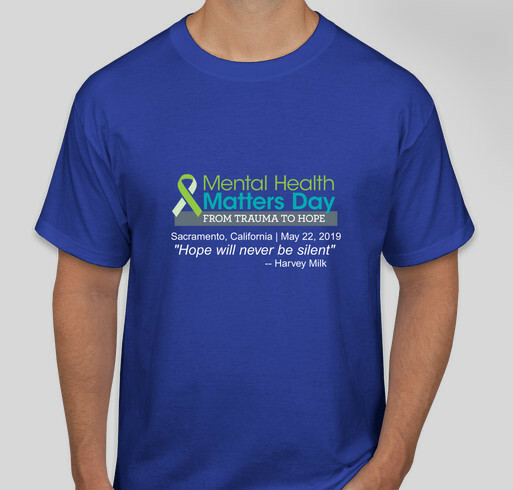 Your purchase of the 2019 Mental Health Matters Day commemorative T-Shirt will help support this important event! All funds raised will go directly to MENTAL HEALTH AMERICA OF CALIFORNIA . I have a family member who was affected by mental issues. I see the lack of understanding by many and the lack of facilities and help for families as well as the affected. I am a mental health client. There is no health without mental health! MHAC is a much needed link for the public to learn about and support effective mental health policy and practice. Keep up the great work MHAC! Share Why You Support "Mental Health Matters Day Commemorative T-Shirt!"